Do you know what Hoplophobia is? It is defined as "fear of firearms." Colonel Jeff Cooper who claims to have coined the word stated that "the most common manifestation of hoplophobia is the idea that instruments possess a will of their own, apart from that of their user." There are many people, educated Malaysians included, who fear guns. Guns are weapons that can cause death by people who want to cause death, and therefore should be rightly feared. But people should not fear guns in the hands of law abiding citizens. My father owns a shotgun that he uses for hunting and he has owned it for as long as I can remember. He put it in the closet and at no time at all when we were younger were we tempted to handle it. We had a healthy respect for that shotgun. My son is 4 years-old and we are teaching him to respect guns, that guns are not toys, and that guns can hurt people if mishandled. We are trying to demystify guns so that as he grows older he will not try to handle guns behind our backs simply out of curiosity. Demystifying guns to young children, in a household that has guns, is the first step to preventing accidents. 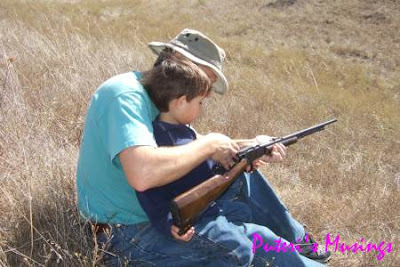 We are teaching him about gun safety so that he knows that with ownership comes responsibility. My husband grew up around guns and he fired his first gun at age 6. He and his father are lifetime members of the National Rifles Association. My husband has quite a collection of pistols and rifles, and I now own a handgun too. Before I came to America, I too had the impression that America had too many guns and that too many people died needlessly because of those guns. That was when I was still ignorant about the 2nd Amendment of the Constitution. The 2nd Amendment states that "A well-regulated Militia being necessary to the security of a free state, the right of the people to keep and bear arms shall not be infringed." This is a right that should be protected and not given away lightly. A government that has an armed citizenry will think twice about becoming a tyrant. Someone commented in a friend's blog that since America is not living under a tyranny, why should people continue to have guns? Duh!? Once the guns are taken away, how are you going to stop the government from becoming one? There are many laws regulating gun use in America. Contrary to popular beliefs, especially with those living outside America, gun related deaths are not out of control in this country. Accidental gun deaths is not the number one killer of children under 14 in this country. Mass shootings like those you hear in the news recently are not as common as are made out to be. It is a fallacy to claim that less guns mean less crime. Switzerland is a country that best illustrates this fallacy. In Switzerland National Service is compulsory and the men keep those guns including assault rifles that they use in their national service training in their homes. You don't hear much news of gun crimes in Switzerland. In countries where guns have been taken away from the citizens, like the UK and Australia, crimes are not down, and neither are homicides. Criminals will always get their guns, legal or not. The only people left defenseless are the ordinary citizens. Police said that two men forced their way into a home on the 1900 block of Sachtjen Street on Madison's north side, near the Dane County Regional Airport, just before 3 a.m.
A couple was home in bed at the time and a woman was pistol-whipped by one of the assailants, who fled without taking anything. The woman is being treated for injuries. If you're faced with intruders in your house, in which situation would you rather find yourself? Bleeding and weakened from the bullet wound in her chest, Susan Gonzalez aimed her husband's .22-caliber pistol, the one she hated, and emptied it into one of the robbers who had burst through the front door of her rural Jacksonville home. Those shots ended the life of one robber, led to a life prison term for another and became an epiphany for Gonzalez, a 41-year-old mother of five who runs a photography studio. My home is still my castle, and if a person enters my home intending to cause me harm, he'd better be prepared to meet his Maker. Engraved on the cylinder of a old West "Peacemaker" Colt .45 revolver. Yes, a firearm is a great equalizer. My perception of gun proliferations leading to gun related crimes changed after reading this post. I guess all the movies involving guns has made us to believe that trigger happy people will shoot to maim or even kill people at the slightest provocation. All the more so as guns are easily available and you can buy one if you fit the seemingly simple criterias. Again I would like to apologize for the oversight on two of your comments in my blogs. I have done the needful and responded to both of them. Please accept my apology. The mainstream media often exploits those kinds of stories .. "when it bleeds, it leads" mentality when it comes to reporting news. In England people are resorting to buying stun guns to protect themselves in their homes. Even stun guns are illegal, but are you going to depend on the police to come to your rescue? But then it could be too late if you are unlucky. Educating ppl abt guns is more important then anything else. Especially the young ppl. Guns is not a toy ...period. In Malaysia...some criminals already uses guns to rob ppl at their homes..
Nightwing, that's right. The criminals have their guns, but the ordinary people have nothing. What is parang good for against an intruder who has a firearm?! Pat, that's true. Criminals have their sources to supply them with illegal weapons, even the latest kinds of firearms. And yes the police force is left with their outdated firearms. Still can kill but they could be better armed against these gut toting criminals. Nice opst. My family have one too. But the only one licenced to hold it is my dad. The gun has put my family more at ease. Of course it is when we we have something lethal to protect us from someone lethal with something lethal too. What, are we going to wait somebody in our family to get killed when we are waiting for aid when something bad happen? Revolver.45? Nice! But then again, if it is doubled with some martial arts, it is going to be much better. Hello Puteri, I'm back. Ahhh, you talking of one of my favourite subjects, guns. One night some years back, my wife and I was watching a late movie, and around 1am....1am!! There was a soft knock on our door. Soft knock. I took a peep thru the keyhole and nampak dua orang hitam. They don't look like collecting for the Red Cross. I grabbed my M-16 semi auto (now since given up to the cops as we went for holidays, dare not keep at home)...anyway, I always keep the empty magazine seperately, so standing next to the door, I slammed the magazine in (it was empty anyway) with a loud double, 'kriickk krrraaack'...and any 5 year old boy will know thats a gun being loaded or cocked. I did not even say anything, those two fellows, big guys too, bolted off as fast as they could run! Ha ha. I love target shooting, but never animals. When I was about 12 followed an uncle at night tembak flying fox. He spotted a monkey and gave me the shotgun. Without thinking, I shot. Puteri...that was the day I swore I will never shoot any animals ever again. That monkey was holding its baby I did not see. The mother died, but the baby survived, my uncle took it home for a pet. But I cried and was affected for weeks after that. Now its paper targets only. Love that Rossi pump of yours. .22? "Here lies Les Moore, three slugs from a .44, no Les, no Moore". Have a nice day, UL. Akmal, you are right. We cannot depend on the police to arrive in time to help us, esp when we are faced by dangerous armed men. Hehe, U.Lee, good to see you back! Yes, that is a Rossi .22 pump action. I like the feel of that rifle and quite accurate too esp for me who has difficulty keep my arms steady! Wow, that is a good way of scaring off the would be intruders. Who does not fear the sound of the click of a hammer being pulled back or the sound of a magazine being slammed into a semi automatic?! Heh, I'm sure that made the would be intruders think twice about coming back to try breaking in another time! That is an interesting line on Les Moore's tombstone! Haha. I'm sure there are people like you who would not shoot an animal. But I still have the strong hunter's blood in me, and when I see certain animals, I see food! Heheh.